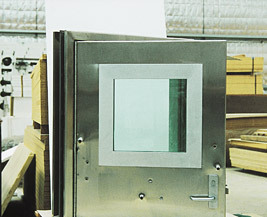 Lietzke Bullet Resistant Doors are manufactured to provide protection for personnel and property from criminal attack. The doors are constructed using a sheet of bullet resistant material supported by a steel sub frame which is totally encased in 1.6mm Steel. Most locking devices and hardware can be factory fitted to the door. 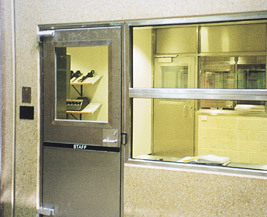 A bullet resistant viewing panel may be incorporated in the door using Bullet Resistant Glass. Bullet Resistant Plate and Steel Sub Frame. Door shall be a Lietzke Stainless Steel sheeted Bullet Resistant Door Leaf pre hung in a purpose made 3mm thick Pressed Metal Door Frame to suit the required wall construction, with hardware pre fitted.